SPORAH TV: I LOVE MY HIGH HEEL SHOES TO THE BOTTOM OF MY HEART..! I LOVE MY HIGH HEEL SHOES TO THE BOTTOM OF MY HEART..! A Strong Voice On BEN TV - Tanzanian Sporah Opens Up! Irene Sporah Njau is one of the biggest African voices in broadcast journalism in the Diaspora, she's the voice of the Sporah Show on Sky TV which broadcasts weekly in Europe and to about 2 million viewers in East Africa. Sporah uses her shows to talk about issues affecting the African Diaspora as well as those in Africa. Many African artists and entertainers have passed through her doorsteps. 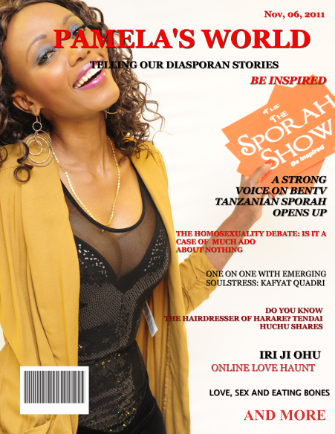 This November, we sit down with Sporah to talk about all things 'Sporah". Please join us. Apart from being a TV presenter, I am a God fearing person, simple easy going with warm personality that shines through wherever I am. What led to the need to create a show such as this? The idea came after watching different TV talk shows and realised how powerful TV is, and how it can influence people’s lives. So my motive was to change people’s lives especially the young generation. So I thought yeah... something is missing in my community and somebody has to do it. So I came up with an idea of a Talk Show. Thank God we are a pioneer of African Talk Show in Europe. What changed? How did you get them to accept it? I had to do more listening and make changes in order to meet the acceptance level but at the sametime I had to stand my ground and not change my initial idea. What are the most difficult topics that you've covered? The one night stand topic. It was difficult in a sense because being an African woman we view this topic as a taboo in our cultures. But, I had to bring this out because it affects so many younger girls of this generation. It was like touching the untouchable. Who was your most interesting guest? Referring to the above topic “One night stand”as I mentioned before these guests were really interesting, as a woman with my background I thought it would be difficult to discuss this topic but surprisingly.!! I must say those guests made my day, because they made it so easy as if they have been carrying a cross for a long time waiting for this platform. Do you feel that there is need for more programming like this? Being an African Immigrant - we are told to stick to certain career choices, when you decided to go a different route - how did your family take it? Sticking to certain career choices are backward beliefs which don’t make much sense in this modern times. Being an African Immigrant does not mean one has to choose a particular career - having said that, this kind of stigma is still in a few immigrant African circles. This may sound crazy, but I did not involve much of my family members when going this direction, they come in at a later stage after the ground was level and there was no turning back, so they had only one choice but to support me. Being a woman, now in the media - are there challenges that you feel that African women deal with breaking the glass ceiling in the global media? Just being a woman in any industry dominated by men is a challenge, and it becomes more challenging when one is an African woman. For example, there are times that I go to meetings and find myself the only woman in the room, so its a challenge for your voice or ideas to be taken seriously and in that case you have to press harder to be heard. But seriously, there are so many talented women out there who are capable of breaking the glass ceiling. It will be great if there were some sort of organization around that supports African women in the media. We really do not have a body to talk to or seek advice when the going gets tough. There are many who start off but were suffering in silence and decided to leave the world of media. We can't find them around anywhere. Tanzania has a great culture, do you bring some of your cultural background into your shows? This is one thing I looooooove talking about “Culture”. I am a loving easy going person, God fearing and I love being in the kitchen. Wow! I will tell you something, if there is one thing I love to talk about it is my “culture”. This is something inside me, it is the way I talk, the way I walk, the way I potray myself and more. Culture is part of my identity. Back to your question YES I do apply my culture into everything that I do. What do you love the most about Tanzania? PEACE & LOVE. Tanzania is a country of Peace and Love. If you were going to convince someone to visit your country what will you tell them? Tanzania is the most peaceful country in Africa, culture wise, wild life, tropical climate, beautiful sceneries all guaranteed from end to end all year around and if u visit our beaches by the sea one would never leave. Have you ever visited other African countries? What other African country will you like to visit and why? Yes, I've visited a few African countries, and for now the country I would love to visit next is Nigeria because it is one of the leading African countries in the media industry. What will you like us to know about Sporah? A part from The Sporah Show, I am a loving easy going person, God fearing, I love being in the kitchen , and lastly but not least, I love my high heel shoes to the bottom of my heart and I can’t live without them. Do you do any routines before going on air ? Some do a funny dance in front of a mirror...? Being a God fearing person, I always put everything I do into God’s hands, so there’s that personal prayer that I do routinely before going on air, which I call 1 to 1 with God. Sporah can be found on facebook - please click Sporah to like her page. You can also follow her on blogspot and others. It's always great talking/chatting or interviewing phenomenal African women in the Diaspora whose work is bringing positive light to Africa. Please click Pamela's World to find more about Pamela's World. "Sporah your pretty and famous, but I doubt if you can cook, i think your so busy that you can't cook one meal. Hi Sporah, i enjoyed reading this interview, and i love looking at your show, keep up the good work. i think all ladies like highheel sio wewe peke yako. if you dont know, i dont see anything special there. i will email you so you can give me an sdvc plse. As a Tv presenter in Ghana you inspires me alot sporah. NDIZI ZA NYAMA WE NDIO MCHAGA WA KWELI, UMESAHAU NA KAMBEGE PEMBENI. You showed me that no matter how much you didn't like someone you can still work with them. is the sporah show opened my eyes and helped me a lot to walk away from a lot of things in life. are you on a relationship sporah??? reading this, you inspire me a lot more! Mh sporah hiyo nguo hapo kifuani,.!!!!! stunning lady aint she folks, sounds like shes going to be one of the worlds top talk show diva but im glad to say she really is not full of herself like some tv presenters can be, shes very sweet haha!! !